These Two LifeSavers Tied The Knot! Rebecca and David are literal lifesavers: her as a nurse, and he as a firefighter. So when this heroic couple decided to tie the knot this past September after eleven years together, we wanted to give them the truly remarkable wedding they deserved! They knew that they wanted to have a wedding with a traditional, elegant feel, but wanted it to still be a fun celebration with lots of little twists…and we were delighted to make it happen. 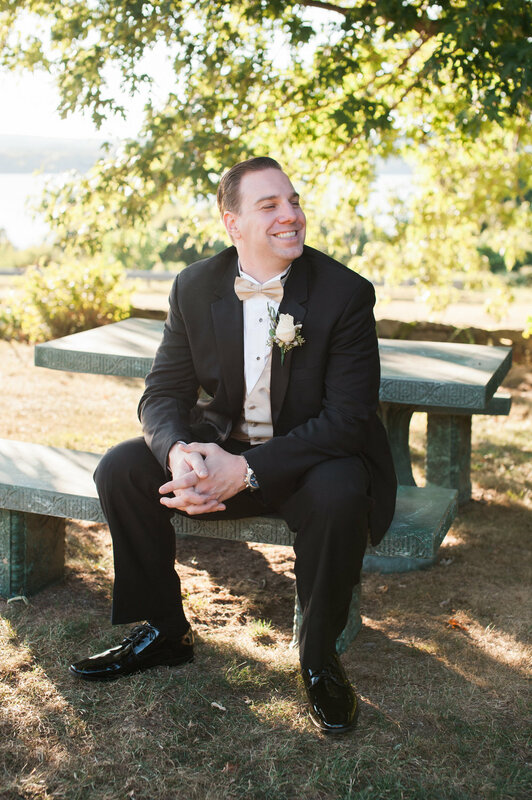 The fall wedding took place on a brilliant Saturday at the Dutchess Manor in Beacon, New York. The bride wore a beautiful Allure Bridals gown that had the perfect balance of lace and beading—both glamorous and modern. 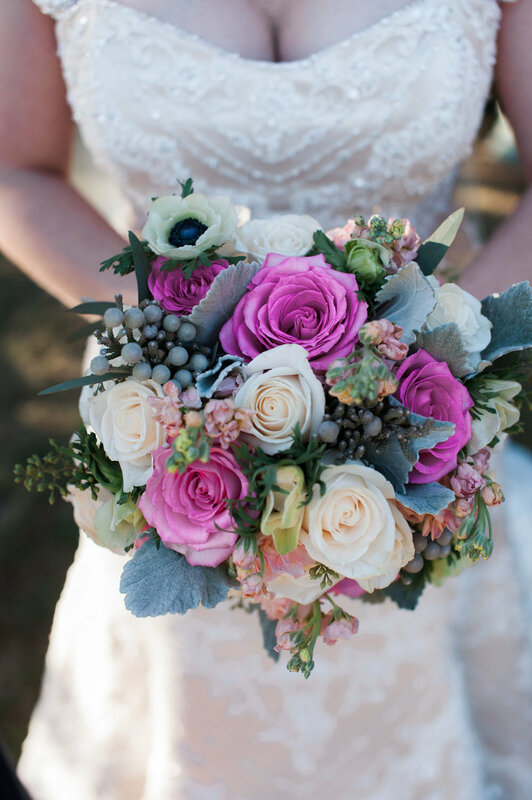 The palette of choice was classic navy, gold, and white with touches of blush pink. Bridesmaids wore gorgeous one-shoulder navy gowns, while the groomsmen (and groom) opted for classic black tuxedos. Did we mention that it was a brilliant day? Probably the best day ever for a wedding—and we have the photos to prove it! The happily wed couple are literally glowing (mostly from joy, but also courtesy of beautiful natural light). After the traditional church ceremony, guests were escorted to the reception space—the epitome of elegance while still maintaining a cozy feel. Gorgeous flowers were arranged by the talented designers at Brewster Flower Garden into silver bowls that adorned each table, perfectly offsetting the rich navy and gold of the napkins, tablecloths, and chairs. Chandeliers cascaded gracefully from the ceiling to bring the entire look together. It was traditional perfection. So to shake things up a bit, the couple opted for a number of fun surprises to add a fresh spin on their otherwise classic wedding. 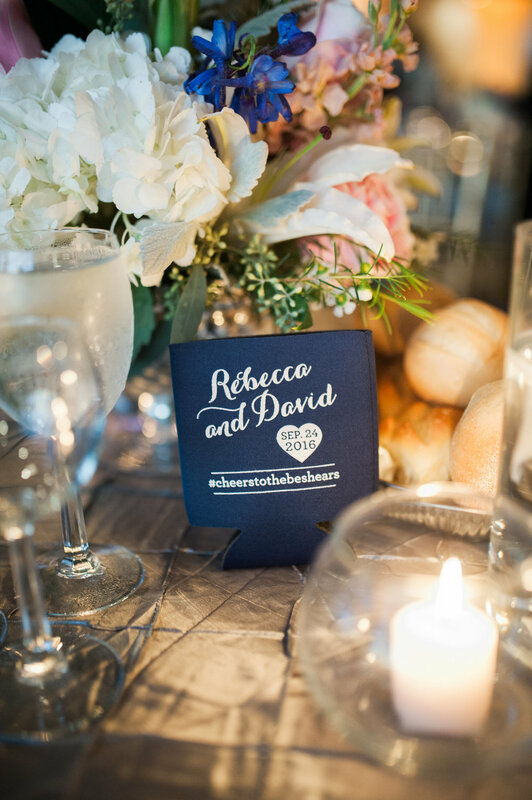 Prior to their four-course meal, guests were treated to a happy hour featuring two signature cocktails designed by the bride & groom themselves (one of our favorite DIY touches we’ve done to date—be sure to read about our others here). There was even a fun spin on the guestbook: instead of simply adding a sweet handwritten message, guests were able to take fun photos in a photo booth that could be included with their note. What a wonderful keepsake for the couple to revisit in years to come! 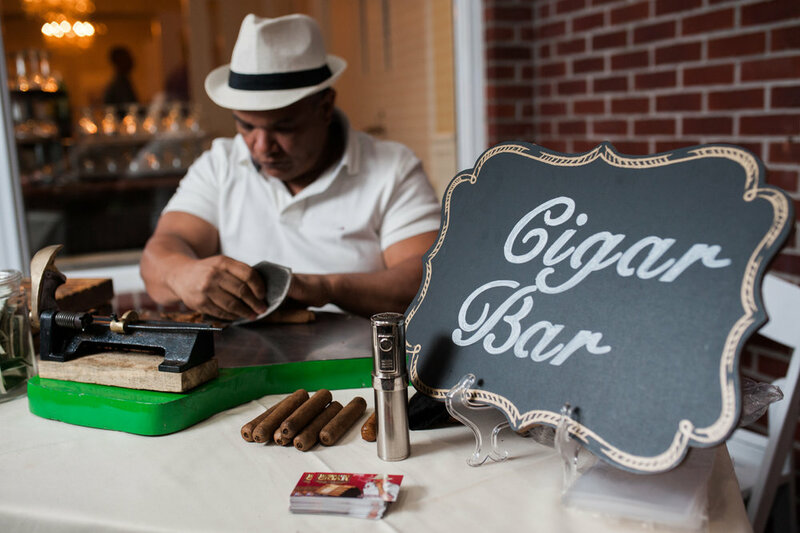 For one smoking hot party favor, the couple brought in a pro from Aroma Dominicano to set up a cigar bar. In addition to a freshly rolled cigar, guests also received a beautiful matchbox commemorating the date and occasion. And as a final touch, the beautifully elegant cake created by The Pastry Garden was topped with a custom topper featuring the bride & groom…and their beloved boxer pup, Tiller. Also to go? Pizza! And not just any pizza: The Cookery’s Doughnation Mobile Pizza Oven provided scrumptious gourmet brick oven pies baked on the spot. Guests were absolutely elated and took home delicious slices topped with bone marrow, traditional margarita, and Brussels sprouts with bacon and ricotta. We love working on weddings that defy expectations and celebrate the couple’s uniqueness and dynamic, and Rebecca and David’s wedding was no exception. Here at Björn & Company, we are experts at finding ways to integrate unique ideas seamlessly together to make a cohesive vision come to life. We loved working on this wedding, and wish the happy couple all the very best! To learn more about our wedding services and packages, click here.